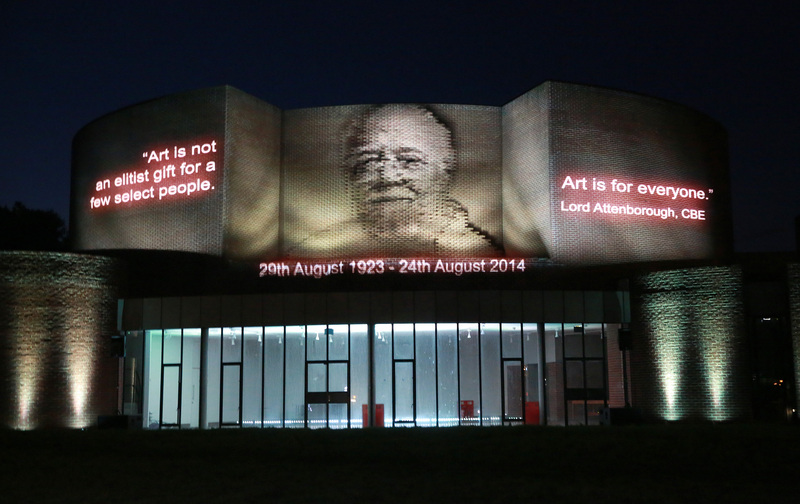 The University of Sussex this weekend paid tribute to the late Lord Richard Attenborough, former Chancellor of the University, on the anniversary of his death (24th August), with a celebration of his life and work screened against the backdrop of the newly-refurbished Attenborough Centre for the Creative Arts. 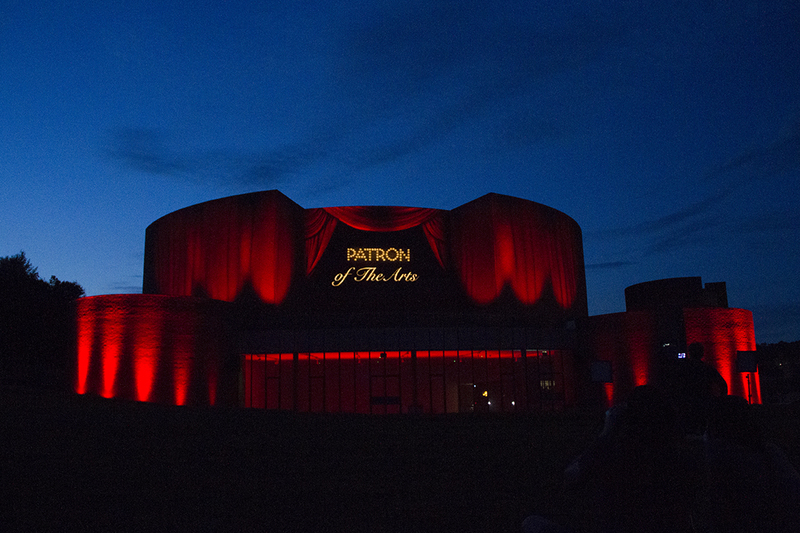 Combining architecture of the building with 3D projection mapping techniques, the Centre was transformed into a stage for Lord Attenborough’s achievements. 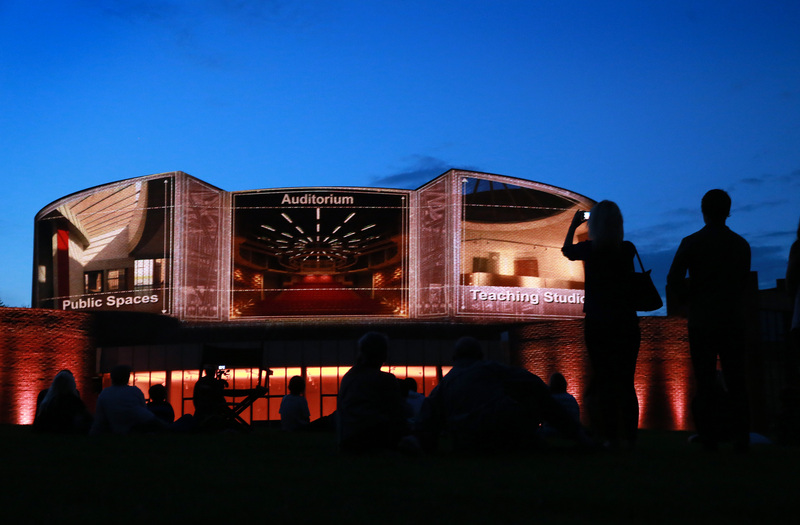 Created by international video and projection designer, Nina Dunn, the work has been projected onto the newly refurbished Attenborough Centre for the Creative Arts, based on the University’s campus just outside of Brighton on England’s South East Coast. Featuring many of Lord Attenborough’s most iconic performances – such as Pinkie in BRIGHTON ROCK and scenes from JURASSIC PARK as well as some of his directing highlights from GANDHI and CHAPLIN – the work pays tribute to Lord Attenborough’s contribution to the arts. Projection Mapping for the launch of the Attenborough Centre for Creative Arts at University of Sussex from Nina Dunn on Vimeo. I think it would be true to say that the film that Sussex University projected onto the side of the Attenborough Centre represents the multi-faceted personality that my Dad was. The moment you tried to pin him down and define him, he’d wriggle away and be somebody else. Of course he acted in over 100 films and directed or produced a huge number, but he didn’t see art as something isolated from the rest of life and he learned from his parents that a full involvement in the wide world was every bit as important. 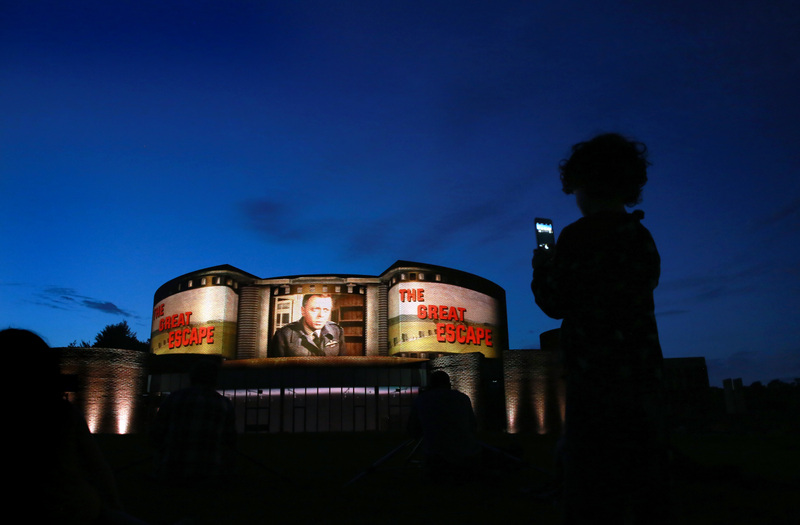 Richard was a larger-than-life personality, which is why this extraordinary and captivating film projected onto the Attenborough Centre building is such a fitting tribute. We fondly remember Richard for his warmth, humanity, humour and vitality. As our Chancellor he brought an element of real celebration to our graduation ceremonies and his regular visits to campus were always a big occasion. He had a gift for making any staff or student that he met, feel very special, and he was very much part of the University community. In the arts world he was a tremendous tour de force. This wonderful work shows us again his remarkable contribution and sets the stage for our own exciting, upcoming programme of arts and performance in this much-loved building on our campus. The Attenborough Centre, the University’s original arts centre designed by Sir Basil Spence in the 1960s and now a Grade II* listed structure, has undergone a multi-million pound refurbishment. The space now hosts a state-of-the-art 350-seat auditorium, extensive gallery and display areas designed for art and audio visual installations, rehearsal studios, breakout creativity zones and a new café and bar – to be enjoyed by students, staff and the public. A public performance programme will launch in spring 2016. As one of the first university campus arts centres in the UK, the building has a storied 50-year history, and has previously seen internationally renowned performers such as Sir Ian McKellen, Gemma Jones, and comics Jack Dee and Lee Evans grace its stage. Sculptor Barbara Hepworth and modernist painter Marc Chagall have both exhibited works, and the likes of contemporary dance companies Ballet Rambert and physical theatre troupe Spymonkey have also appeared at the venue. 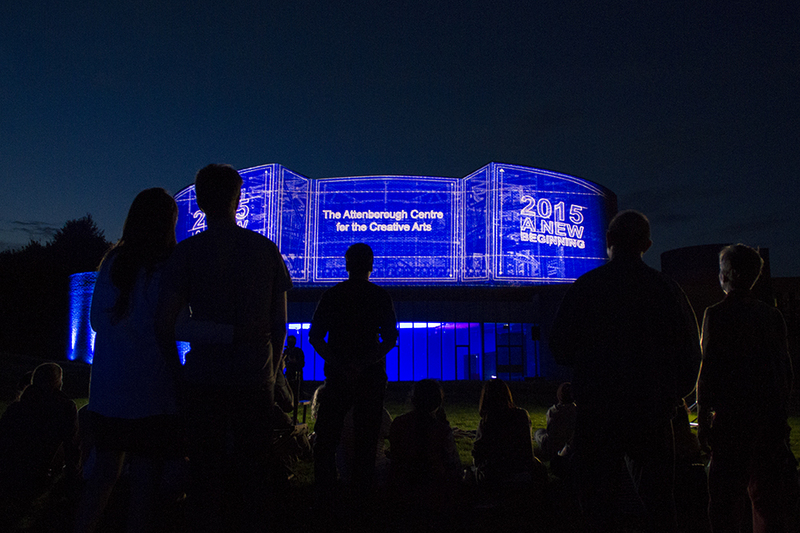 In its new guise, the Attenborough Centre will continue to support emerging talent and established acts alike. The event has been devised in partnership with 3Dify, projection designer Nina Dunn of something Graphic, digital and creative agency Developing Dreams, and This World Productions. The video production team consisted of Nick Nenov, Louise Rhoades-Brown and Noor Alnaqeeb. Sound design was by Sebastian Frost and Lighting by Richard White. Sam Jeffs was the chief Video Technician with Daniel English as a second video technician. The equipment supplier was XL Video.